Knowing how to use scaffolding for your next project will save you lots of time and effort. Renting scaffolding is money well spent. Think of all the time you will save by not going up and down a ladder to move it from side to side while you work on your home project. Scaffolding is a temporary structure used to support workers and materials to aid in construction, maintenance, and repair projects. Scaffolding is a practical option to using a ladder when movement at a level higher than ground level will save you time. When erected in the proper way, scaffolding can be much more sturdy than using a ladder for your project. At Northside Tool Rental, we rent all of the scaffolding components that you need to assemble a safe scaffolding system for your project. Scaffolding erection will be much easier, and faster if you have someone to assist in the assembly process. 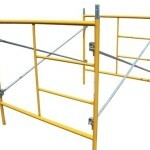 Start your assembly by laying two end frames about 7 ft. apart, near your worksite. Slide on the adjusting screws and base plates or casters now so you don’t have to lift the entire scaffolding later to put them in. Secure the base plates (or optional casters) to the adjusting screws with the special pigtails or toggle pins supplied. These pigtails are designed to lock in place. Use the same connectors to secure the guardrail posts to the scaffold frame and connect stacked scaffold frames where they join. Stand one end frame and slide the crossbar ends over the pins. Rest the cross brace on the ground to temporarily support the first end frame while you move the other one into position. Tip the second frame up and slip the opposite end of the cross brace over the pins in the second scaffold frame. Complete the frame setup by attaching the second cross brace on the opposite side. Lift the rented scaffold planks from the middle and angle them up through the frames until both ends are above the frame. Then lower the plank until the ends hook over the frames. Secure the plank with the provided attachment components. Prevent falls by installing a guardrail system. Slide the guardrail posts over the top of each frame and secure them with a pigtail, toggle pin or bolt, depending on what was provided with your scaffold components. Install top and bottom rails between the posts. Tip: Don’t be tempted to save money by using your own ordinary wood planks for the work surface—they aren’t strong enough. Rent special scaffold planks to cover the frames from side to side. Before you begin work on your project and climbing up onto your scaffolding, thoroughly examine the scaffolding setup to make sure all pieces are secure. If your scaffolding wobbles or rocks, readjust one of the screws to stabilize the scaffolding. Reinspect the scaffold system every time you leave the site and return to it to make sure it is still safe. Do not roll the scaffolding with tools, materials or passengers on the planks. Make sure that your scaffolding is completely clear before moving. Lock the casters before climbing the scaffolding. Avoid overhead wires when moving the scaffolding. You could be electrocuted if you bump power lines. Don’t roll the scaffolding on steep slopes or near ditches or holes. Once your scaffolding is erected, it is heavy. Don’t risk having your scaffolding topal over and cause injury. It is always best to have additional help if you attempt to move your scaffolding after it is erected. Keeping safety in mind, don’t take shortcuts and climb on the cross braces. Use the integrated ladder to climb up the scaffolding. If you need assistance with scaffolding rental or scaffolding erection questions, just ask. We can help you learn how to use scaffolding for your next project.